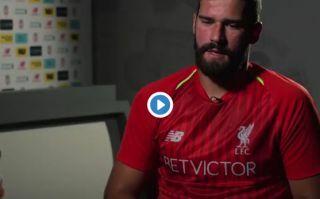 Liverpool’s new goalkeeper Alisson has given a video interview explaining how Mohamed Salah got in touch with him about joining the club. Speculation has been rife involving the Brazil international heading to Anfield in the last few days, and he’s finally been confirmed this evening. Alisson and Salah were team-mates at Roma and it seems the Egypt international was desperate to see his old colleague join him on Merseyside. Salah made the same move last summer and has been a big hit, and it seems he rates Alisson very highly as he pushed him for answers over his transfer. “We didn’t have that much contact after he left Roma. We met again in the game when we were up against each other [in the Champions League in April],” Alisson told Liverpool’s official site.